« 7th Sunday of Pascha – Holy Fathers of the First Ecumenical Council Why do we commemorate the First Ecumenical Council and read the High Priestly Prayer of Jesus between Ascension and Pentecost? Christology and moral teaching in the High Priestly Prayer of Jesus Christ. Sunday of the Fathers of the First Ecumenical Council. 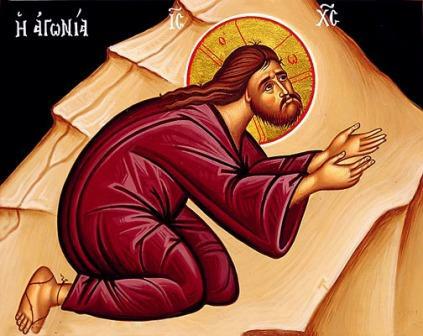 Synopsis: The Christology of the High Priestly Prayer of Jesus Christ (which He made just before His arrest on Holy Thursday) is explained, and then the moral application of this prayer which is as important as the dogma in it is discussed. Our Lord proves that He is equal to the Father, and gives us two instructions on what we must do to be saved. Both instructions are intimately related to His relationship with the Father, and consequently what our relationship should be with God and our neighbor. John 17:1-13TEXT 1 These words spake Jesus, and lifted up his eyes to heaven, and said, Father, the hour is come; glorify thy Son, that thy Son also may glorify thee: 2 As thou hast given him power over all flesh, that he should give eternal life to as many as thou hast given him. 3 And this is life eternal, that they might know thee the only true God, and Jesus Christ, whom thou hast sent. 4 I have glorified thee on the earth: I have finished the work which thou gavest me to do. 5 And now, O Father, glorify thou me with thine own self with the glory which I had with thee before the world was. 6 I have manifested thy name unto the men which thou gavest me out of the world: thine they were, and thou gavest them me; and they have kept thy word. 7 Now they have known that all things whatsoever thou hast given me are of thee. 8 For I have given unto them the words which thou gavest me; and they have received them, and have known surely that I came out from thee, and they have believed that thou didst send me. 9 I pray for them: I pray not for the world, but for them which thou hast given me; for they are thine. 10 And all mine are thine, and thine are mine; and I am glorified in them. 11 And now I am no more in the world, but these are in the world, and I come to thee. Holy Father, keep through thine own name those whom thou hast given me, that they may be one, as we are. 12 While I was with them in the world, I kept them in thy name: those that thou gavest me I have kept, and none of them is lost, but the son of perdition; that the scripture might be fulfilled. 13 And now come I to thee; and these things I speak in the world, that they might have my joy fulfilled in themselves. This entry was posted on Sunday, June 5th, 2011 at 9:40 pm and is filed under 7th Sunday of Pascha - Holy Fathers of the 1st Ecumenical council, Audio homilies, Homilies. You can follow any responses to this entry through the RSS 2.0 feed. You can leave a response, or trackback from your own site.